Boil lentils quite slowly, put a fried onion to it, sour it, spice it, add raisins, and serve it over toasted bread as an evening meal. Balthasar Staindl, Ain künstlichs und nützlichs Kochbuch, 257. The text of this recipe is taken from The Kitchen, Food, and Cooking in Reformation Germany (2016) by Volker Bach (p 123). This recipe, featuring expensive spices and dried fruit, could never have featured at a peasant’s table. There are a number of dishes from the medieval period that take lowly ingredients and pair them with the costliest ingredients, perhaps as a medieval joke. Peel and finely dice the onion, then fry it until it softens and changes colour. Combine all ingredients in a pot, using enough liquid so ingredients are well covered. Cook until the lentils have softened, adding more liquid if necessary. 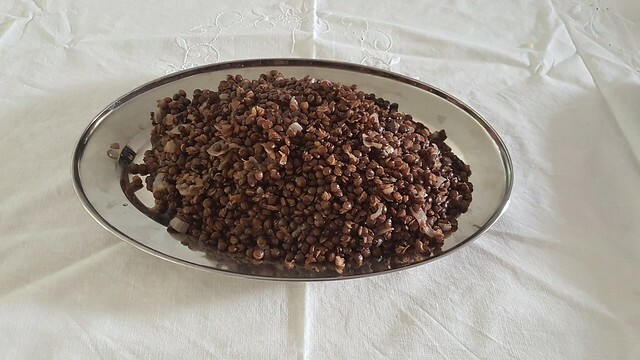 You can either serve the lentils as a side dish – in which case the lentils need to be drained, or as a soup, in which case the soup should be served with toasted bread. There are many different sorts of lentils, and many have been staple foods since prehistoric times. However it’s often to decide which type of lentils to use, especially when looking at regional cooking. In the dish illustrated below, I have used French green lentils (sometimes called Puy Lentils), as I like the taste, and they stay whole when cooked so are great to use when lentils are to be a side dish. If making this as a soup, I would probably use brown or red lentils, as these start to go mushy when cooked, and make an excellent basis for a soup. The recipe is vague as to what spices should be used, giving the cook licence to use any spice mix, or whatever was to hand. I have used spices that to me complement the sweet and sour flavours of the dish. If using ginger, try to track down whole dried ginger which has to be grated before use. This is the way ginger would have been purchased in the medieval period, and it has a far more powerful flavour and scent. For examples of other dishes that create a “noble” dish from “peasant” food, check out these recipes for Bohemian Peas and Turnip with Pudding Inside. Click on the links below to buy direct from The Book Depository. Albala, Ken (2007). Beans: a History. Bach, Volker (2016). The Kitchen, Food and Cooking in Reformation Germany. Then pound the almonds well, put them in a bowl and pour good cream therein, not too much. Whip the almond paste very well, so that it becomes smooth, put sugar therein and allow it to cook for a short while. When you serve it sprinkle sugar on top, then it is a lordly pudding. Take three fourths of a pound for a dish. The text of the original recipe can be found here. The translation is by Valoise Armstrong, and can be found here. This is an incredibly simple dish – just three ingredients. However, two of those ingredients are expensive imported ingredients, and must be heavily processed before being used in this dish. This would indeed make it a “lordly” dish. 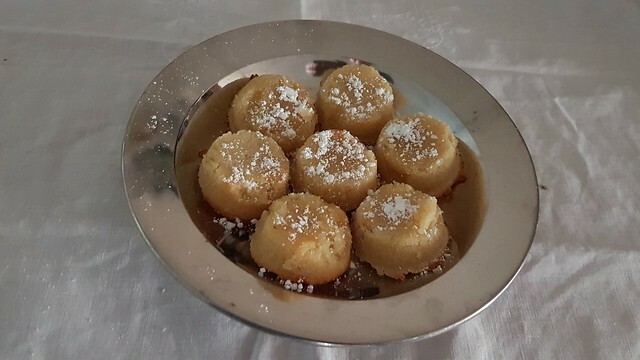 This is one of several similar almond dishes in Sabina Welser’s book, where almond meal is combined with a liquid binding agent, sometimes gently cooked, other times not. All these dishes use delicate flavours. Combine the almond meal and icing sugar and mix well. Add the cream and mix well, so the mixture adheres. You may find the mix is a little stiff – it’s supposed to be. Spoon the mix into mini muffin trays, and bake in a 120℃ oven for around 20 minutes. When the puddings are cool, turn onto serving platters and dust with extra icing sugar. Makes around 12 individual puddings. I confess I’m not too keen on “pudding” as a translated name for this dish. It fits with the modern interpretation of pudding being a sweet dish; however, in the sixteenth century “pudding” was a term exclusively associated with English cooking. A pudding at this time was a combination of starch and fat, sometimes accompanied with sugar and spices, other times by offal, that was cooked by steaming in a casing (usually intestines). However in the absence of anything else, “almond pudding” is a reasonable name to describe this dish to a modern audience. Take good apples and peel them and grate them with a grater and put a little fat in a pan over [the fire] and let it become hot and put the apples in it and let them roast therein. After that put good wine thereon, sugar, cinnamon, saffron and some ginger and let it cook together for a while, then it is ready. One should boil the small birds first and then roast them in fat. Sauces were an essential part of medieval and early modern cooking. As well as enhancing flavour, they were an essential part of healthy cooking. The practice of medicine was dominated by the theory of the four humours – fire, earth, water and air. Every food was dominated by one of these humours, some to a level that was considered dangerous. Using the right sauce with a particular dish could reign in this danger and make the food more healthful (Scully, 1995, 13). However, too much of a particular sauce could be harmful in itself! (Klemettilä, 2012, 87). Sauces were typical accompaniments for boiled or roasted meat. They were a particular mark of social distinction, and Germany was particularly well known for fruit sauces such as this one (Bach, 2016, 150). The quantity of sauce below makes a generous accompaniment for around 500g of meat. Grind the saffron and soak in boiling water, which will turn bright orange. Peel, core and grate the apples. Melt the butter in a heavy based pan, and add the apple. Fry it until it softens. Add the rest of the ingredients, including the saffron water, and cook until the desired consistency has reached. Stir occasionally. 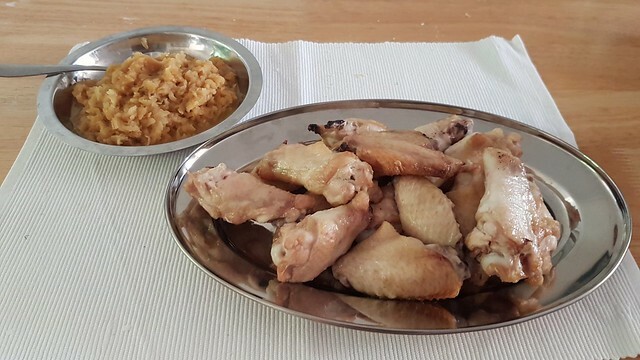 Serve warm, with chicken wings (as displayed below) or any other poultry. The sauce can be made ahead of time and reheated. Klemettilä, Hannele (2012). The Medieval Kitchen. Take eighteen ounces of chard or spinach, three ounces of grated cheese, two and one half ounces of olive oil and the fresh cheese from six ounces of curdled milk. And blanch the herbs and chop them small and stir it all together and make a good covered tart with it. Often in medieval cooking manuscripts there are recipes like this one – a dish named for a foreign region, in this case the city of Genoa in Italy. Sometimes it’s effectively impossible to work out why the dish acquired its name; I suspect in some cases it was to give an otherwise pedestrian dish a little pizzazz. 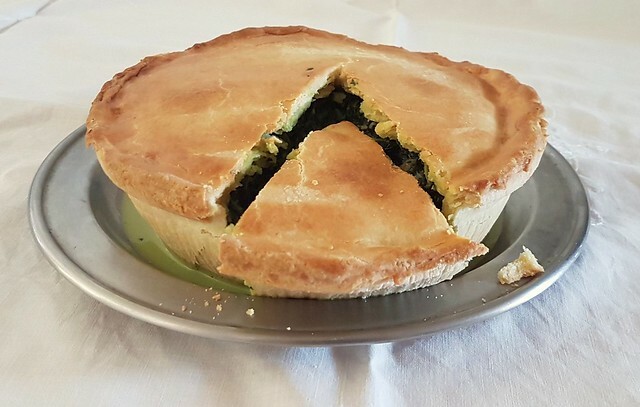 However, when I looked in Italian recipe collections I found recipes that were very similar to this one – a pie where the principal ingredient was spinach, combined with other ingredients. For instance, Maestro Martino’s Libro de Arte Coquinaria (The Art of Cooking) features a recipe for spinach torte in the Genoese style; a rather luxurious dish where the spinach is combined with almonds, walnuts, spices and caviar (Martino, 2005, 123). 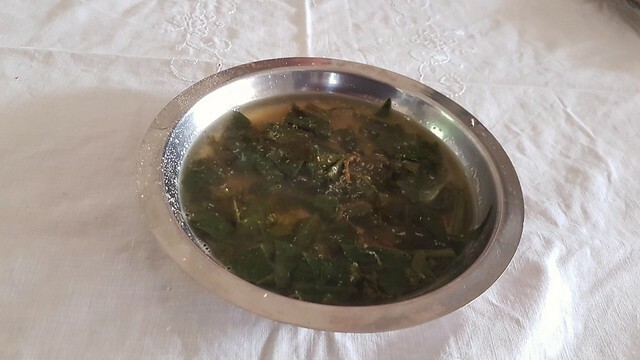 Bartolomeo Scappi’s Opera has a recipe (V.97) very similar to Sabina Welserin’s, where the spinach or chard is combined with fresh cheese, mint and pepper (Scappi, 2008, 481). Most Italian regions had special names for pies and tarts. The Genovese version was called a gattafurra, and appears to have been quite shallow compared to those from other regions, and was always covered. The first time I made this recipe, I had run out of wheat flour so I used spelt flour. However, I forgot to adjust the recipe for the different flour. When I got the pie out of the oven, the pastry collapsed and tore a little more every time I looked at it or breathed in its direction. And to make matters worse, I didn’t pay attention to Sabina Welserin’s recipe, which is quite specific about the ratio of ingredients to use. 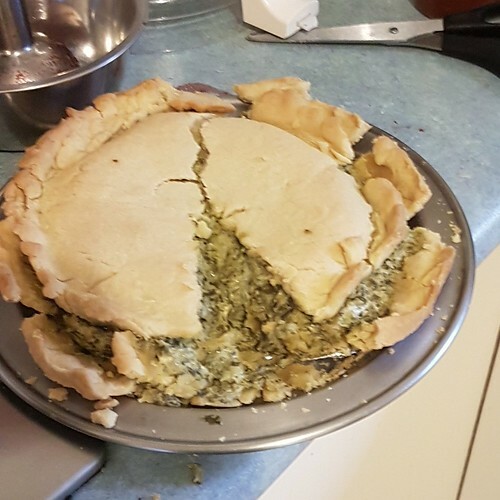 Essentially my filling had half as much spinach, twice as much parmesan cheese and four times as much fresh cheese. It really wasn’t pleasant to eat. 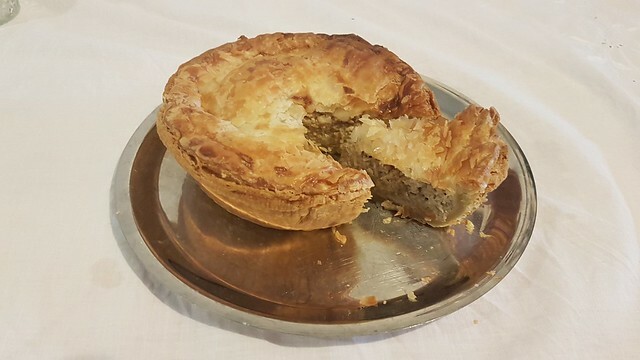 Once I adjusted the quantities to Sabina’s specifications, the pie was delicious, and would make a good addition to any feast, whether for vegetarians or everybody. Roll out the pastry to approx. 4mm thickness and line a greased pie plate with it. Blanch the spinach or silverbeet until the spinach has softened and lost most of its moisture. Add the cheeses, oil, salt and pepper, and mix well. Pour the mixture into the pie shell, and smooth off. Roll out a pastry lid and place on top of the pie. Trim the edges and press the lid into the tart rim. Cut a small incision into the lid of the pie. Bake the tart or pie in a 180°C oven for around 30 minutes for a tart, or 45 minutes for a pie, until the pastry is golden. Parmesan cheese was a coveted, imported luxury in Germany, (Bach, 2016, 163), and is used extensively in Sabina Welser’s book. Parmesan was probably first exported from Italy in C14, and was prized throughout Europe. The relative dryness and higher salt content of a good parmesan cheese makes it easy to transport long distances without spoiling (Kindstedt, 2012, 155-157). If you are uncertain about using Parmesan in this recipe, you could substitute a milder cheese, such as Gouda or Edam. In Australia, what is often sold as spinach is actually silverbeet (Beta vulgaris). This is an ancient vegetable known throughout Europe, and is also known as chard. True spinach (Spinacia oleracea) is called English Spinach in Australia, however as Sabina specifies either leafy vegetable can be used, you don’t need to be pedantic. Note: I originally published this recipe with a note stating true spinach would have been recently introduced to Germany in the mid sixteenth century when this recipe was compiled. I had a few people contact me to rightly question this. Foolishly, I applied the probable date of true spinach’s introduction in England to the rest of Europe. Sixteenth and seventeenth century herbals that describe spinach describe it as a recent introduction, whereas spinach and chard are mentioned separately in European cooking manuscripts as early as the fourteenth century. I’ve removed this note from the recipe, and if I ever make the same mistake, please feel free to point me back to my own words to show I’m wrong. Kindstedt, Paul (2012). Cheese and Culture. Martino, Maestro of Como (2005). The Art of Cooking: The First Modern Cookery Book, trans. Jeremy Parzen. Scappi, Bartolomeo (2008). The Opera of Bartolomeo Scappi (1570), trans. Terence Scully. Take apples, peel them and grate them with a grater, afterwards fry them in fat. Then put in it as much grated cheese as apples, some ground cloves, a little ginger and cinnamon, two eggs. Stir it together well. Then prepare the dough as for a flat cake, put a small piece of fat into it so that it does not rise, and from above and below, weak heat. Let it bake slowly. This is one of a number of recipes in Sabina Welserin’s cookbook for an apple tart; presumably they were a staple fruit of the area. But unlike the Apple Pie with Raisins, this recipe stops you in your tracks. It’s not just the unusual description of the pastry, it’s the filling – apples, with cheese?! However, it isn’t as strange as it seems – apple is often found on cheese boards. The filling itself is a pleasant, subtle mix of sweet and savoury, and is a great way to introduce feast attendees to the practice of serving sweet dishes with meat. Sabina’s instructions for the casing for the dish are unclear. I have chosen to interpret this dish as a typical pie, however it’s entirely possible this is meant to be a strudel, where the filling is put into the centre of the dough, and the dough is folded over to encase the filling. If anyone has any other interpretations, I’d be happy to hear from you! Melt the butter in a pan, then add the grated apple. Fry the apple until it is warmed through. Add the spices, eggs and cheese to the apple, and mix well. Pour the apple mixture into the tart shell, and smooth off. If you want to make a pie, roll out a pastry lid and place on top of the pie. Trim the edges and press the lid into the tart rim. Cut a small incision into the lid of the pie. In the recipe, I have specified Parmesan cheese. This was a coveted, imported luxury in Germany, (Bach, 2016, 163), and is used extensively in Sabina Welser’s book. Parmesan was probably first exported from Italy in C14, and was prized throughout Europe. The relative dryness and higher salt content of a good parmesan cheese makes it easy to transport long distances without spoiling (Kindstedt, 2012, 155-157). If you are uncertain about using Parmesan in this recipe, you could substitute a milder cheese, such as Gouda or Edam. Peel the apples cleanly and take out the cores, chop them small and fry them in fat, put raisins, sugar and cinnamon therein and let it bake. This is one of a number of recipes in Sabina Welserin’s cookbook for an apple tart; presumably they were a staple fruit of the area. This particular recipe is remarkably similar to some modern apple pie or tart recipes. Do a Google search for “Apple Pie raisin” and you’ll find recipes that differ from Sabina’s only in the detail. And there is a reason why this recipe has been around for at least 500 years, because it is delicious. This would be a good recipe to serve to people who are unfamiliar with medieval food, due to its comforting familiarity. 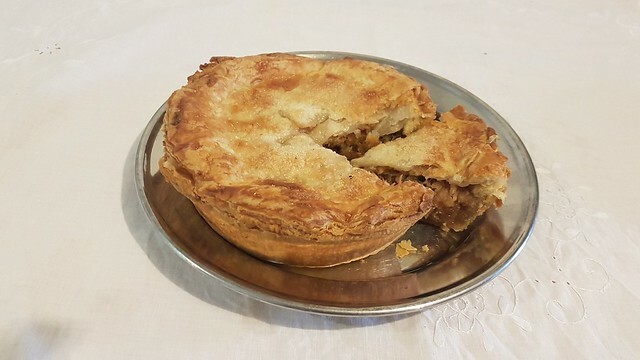 Although Sabina doesn’t specify including a lid to the tart (making it a pie) there are other tart recipes, such as 186 (a herb tart) and 188 (a prune tart) where the maker is instructed to make a cover for the tart. We did make the tart into a pie, as this are more familiar to our eaters (and I happened to have some thawed puff pastry available). Add the sugar, raisins and cinnamon to the apple, and stir through.